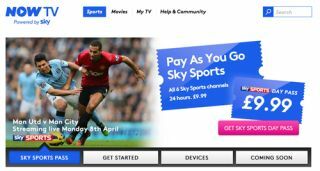 Sky Sports pay as you go comes to Now TV | What Hi-Fi? From today Sky Sports will be available on a pay-as-you-go basis on NOW TV, Sky's internet TV service. For £9.99, customers can get unlimited 24-hour access to all six Sky Sports channels on devices such as the Xbox 360, smartphones, tablets and computers. Viewers will get access to matches from Barclays Premier League and UEFA Champions League, all 19 Formula 1 Grands Prix, all ten Ashes test matches, three of golf's four majors including The Masters and exclusive ATP Tennis. NOW TV already offers instant access to Sky Movies, with a choice of 600 films on demand. Sky announced the pay-per-view service was coming back in January, and the servie is now live on NOW TV.